A donkey and sheep have taken centre stage at a Christmas Carol concert with a difference at a livestock market. 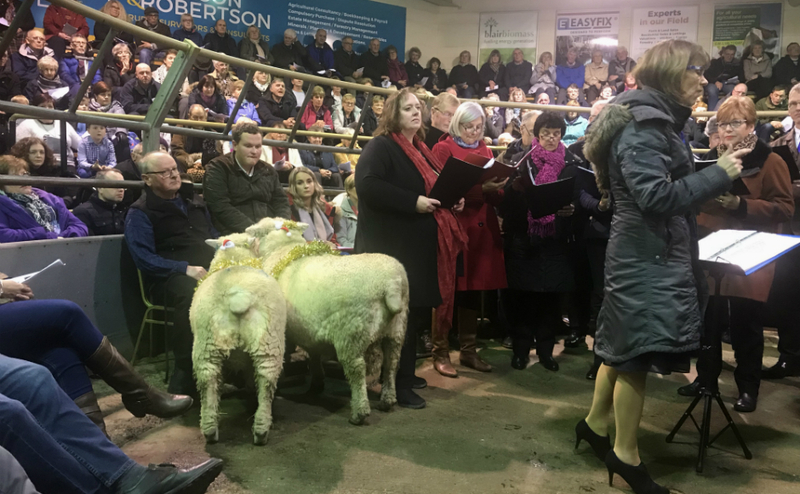 It was standing room only at Ayr Mart last night as around 250 people of all ages came together to sing classics like O Come All Ye Faithful, Away in a Manger and Once in Royal David’s City. It was standing room only at a special Christmas Carol concert at Ayr Mart. Organised by Rev Chris Blackshaw, the Church of Scotland’s only dedicated minister for the farming community, the “uplifting” evening began with the animals and choir being piped into the ring by Bagpiper, Aaron Wardrop. There were meditations and Bible readings, delivered by local people including an eight-year-old boy who recited Matthew 1:18-22 off by heart, along with poetry and music by Crossraguel Choir and Ceilidh band, The Rural Revellers. Bright and colourful Christmas trees and a wreath added some festive sparkle to the ring. Mr Blackshaw, who is employed by the Presbytery of Ayr to support the region’s farming community, sang O Holy Night to mark the moment when Jesus, the Son of God was born in a stable in Bethlehem. His pregnant mother, Mary, is said to have travelled to the town on a donkey. Mr Blackshaw said: “The Carol Service was a great success, around 250 people attended and it was standing room only. “Christmas is always a special time for so many people and I have been very pleasantly surprised by the faith that exists amongst the farming community. Mr Blackshaw said around £420 was raised for the Royal Scottish Agricultural Benevolent Institution, which supports people in the farming community. 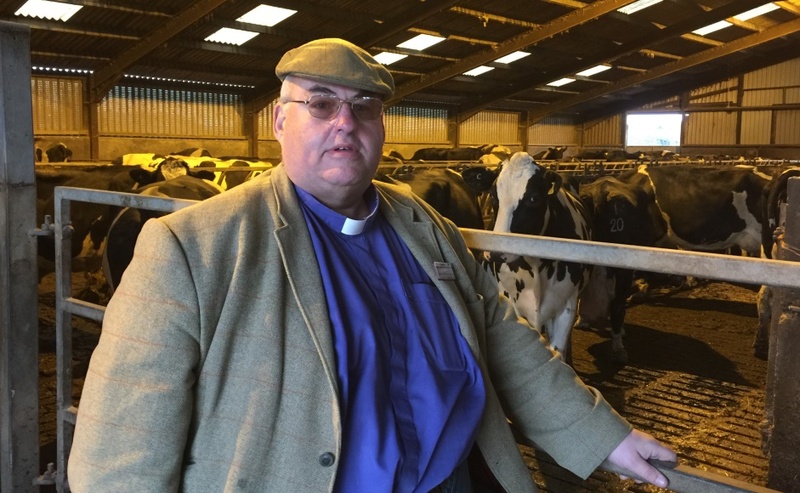 Rev Chris Blackshaw visits farms across Ayrshire to provide spiritual and family support and counselling. Mr Blackshaw visits farms across Ayrshire to provide spiritual and family support, counselling and encourages people to buy local produce. The 58-year-old also interacts with young farmer groups, National Farmers Union Scotland representatives, visits the weekly livestock mart and attends annual agriculture shows. Mr Blackshaw, a farmer’s son, will also draw together groups of people linked to the industry like vets, government agencies, livestock mart staff, those servicing the farming industry and estate workers. A retired police sergeant, he has experience enabling him to provide support to people dealing with a wide range of issues such as bereavement, addictions, illness, depression, stress, suicide and isolation. The "innovative and creative" Pioneer Ministry post is an initial five-year appointment supported by the Church of Scotland’s Ministries Council and the Presbytery of Ayr. The new role has been warmly welcomed by National Farmers Union Scotland and rural charity RSABI who say the perilous state of the ailing sector is taking a "serious" toll on the health and wellbeing of many people who too often "suffer in silence". Mr Blackshaw, who owns a smallholding in Cumbria and keeps English long horn cattle, pigs and sheep, said farming can be a very isolating profession. “For some farmers there are not many people who they can turn to and have a confidential conversation with,” he explained. “My job is about letting people know there is someone there who cares and wants to help them, especially when they think there isn’t anyone and showing them that Church is very relevant in their day-to-day lives. “It is about communicating with people in a language and context that they understand and feel comfortable in."